Ceramic Protection in a simple spray bottle! 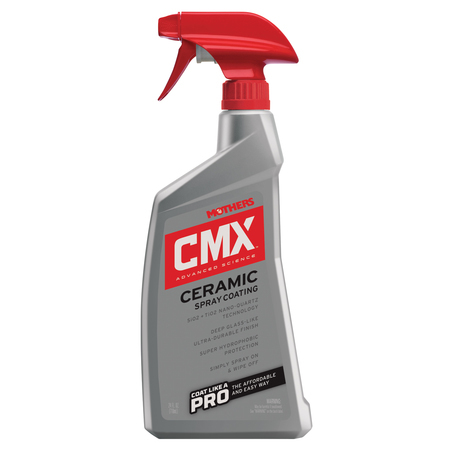 Mothers CMX Ceramic Spray Coating is a user-friendly, professional-grade, ultra-durable, super-hydrophobic protection formula designed to protect your car from the elements! Just spray on and wipe off Mothers CMX to protect your car with a game-changing SiO2 (silicone Dioxide) and TiO2 (Titanium Dioxide) blend that offers fantastic glass-like glossy ceramic appearance.It also offers relentless water beading without sacrificing true optical clarity. Detailers and car care enthusiasts have been raving about this product since its launch. We were excited when we saw the YouTube videos of this product being used by detailers in the USA and, having tried the product, we can assure that the hype is justified! You won’t sacrifice the clarity and durability of a wax product by switching to Mothers CMX Ceramic Spray Coating as it can be used a booster to your existing sealant, or on its own! Apply CMX in layers for increased depth, durability and protection!